Does any of this sound familiar to you? Maybe it was an answer you received after submitting an idea to enhance your green space or facility with sustainability features? All too often, local park and recreation departments across the United States are having to get creative when it comes to funding improvement projects and green initiatives because funding can be difficult to secure. In fact, the National Park Service’s Budget Justifications and Performance Information report shows a two-year decline in funding authority. Fortunately, there are nonprofits partnering with and financially supporting community parks and local green spaces to improve the health of our planet. The Green Mountain Energy Sun Club® is one of several nonprofits working to make changes for our environment. Its mission is to invest in nonprofits to advance sustainability for people and for the planet, and it’s delivering conservation programs and sustainability solutions to like-minded nonprofits that want to change the effect people have on the planet. Sun Club understands how instrumental nonprofit organizations are to the well-being of communities. It also understands an organization’s funding is generally dedicated to expenses that help achieve the organization’s mission. So, Sun Club offers sustainability solutions to help nonprofit organizations operate more sustainably without taking away resources that otherwise would have gone to the community. Its sustainability solutions are geared to help nonprofits lessen their carbon footprint, and often, these sustainability upgrades result in a cost savings that allow the nonprofit to do even more. Since its founding in 2002, the Sun Club has been donating sustainability grants to nonprofits in communities where Green Mountain Energy® does business (mainly in Texas and Illinois and along the Northeast). Green Mountain, the nation’s longest-serving renewable energy retailer, offers consumers and businesses 100 percent pollution-free electricity made from renewable sources. Thanks to donations from loyal customers, dedicated employees and Green Mountain Energy, the Sun Club is funding grants to nonprofit organizations that want to execute sustainability projects promoting renewable energy, energy efficiency, resource conservation and environmental stewardship. “Making a long-term difference in communities and setting an example to future generations about the power of sustainability is a great investment,” says Mark Parsons, president for the Sun Club. Thanks to a $313,500 sustainability grant from the Sun Club, Evelyn’s Park, near Houston, Texas, is considered one of the most sustainable parks in the nation. Five acres of historic land were transformed into a natural green space, where the community can connect with nature amid an energetic urban landscape. The Sun Club helped the park achieve net-zero energy status for day-to-day operations by using solar power. It also funded a rainwater capture system that reduces the park’s water consumption by 40 percent. And, on-site tumbler composters (for fruit- and carbohydrate-based food waste, coffee grounds and food packaging) help the on-site café minimize waste production while creating nutrient-rich soil for the park. Built at one of the historic entrances at Frick Park, the Frick Environmental Center, in Pittsburgh, Pennsylvania, is another Sun Club recipient, receiving a $63,400 grant. This innovative eco-center is one of the greenest municipally owned buildings in the world and serves as a living laboratory, where visitors can experiment and learn about sustainability, resource conservation and the power of nature. The sustainability grant funded a portion of the solar array, which assisted the facility in meeting the Living Building Challenge and LEED Platinum standard for energy efficiency. Last year, solar panels produced 122 percent of the facility’s power, and a rain capture system collected 235 percent of the facility’s water. In 2018, the Environmental Center saw a cost savings of more than $11,000 on energy usage alone and was able to sell surplus energy back to the local electric utility. These sustainability features complement the ecological landscape of the park while preserving its historical integrity. Oak Park Conservatory is one of three historical sites in Oak Park, located near Chicago, Illinois. 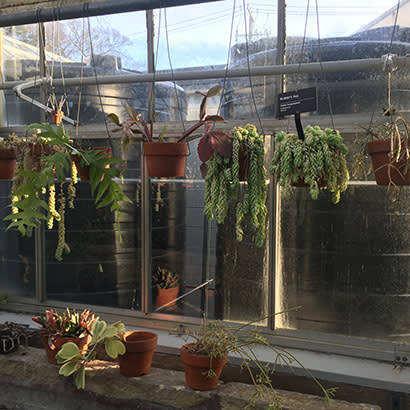 It features three indoor rooms showcasing Mediterranean, tropical and desert flora and fauna, along with Illinois’ native ecosystems in the outdoor gardens. It has been awarded $100,000 in Sun Club funding. Solar panels, water-harvesting tanks, compositing sites and bee-hives will be added to the Conservatory as a result of Sun Club funding. Each eco-improvement plays a significant role in reducing the organization’s carbon footprint. Solar panels will help the Conservatory save more than $2,000 a year in electricity costs, offsetting its electrical demand by 16 percent. The 5,000-gallon cistern will collect 80,000 gallons of water a year for watering needs, helping conserve resources while educating visitors. Signage depicting how the tanks function will help visitors learn about water-conservation techniques that lessen the impact on our environment. Through fundraising support, Montgomery Parks Foundation strengthens the park system in Montgomery County, Maryland. And with a $96,000 grant from Sun Club, it will fund two of the seven requirements for a Sustainable Education Every Day (SEED) classroom located in Black Hill Regional Park (Boyds, Maryland). A SEED classroom is self-sustaining and transportable and puts hands-on sustainability education in the forefront, focusing on responsible construction of school buildings and facilities. Sun Club contributions are funding the net-zero energy and water requirements for the classroom. Inverters, LED light fixtures, sensors, and other controls and equipment are needed to ensure a net-zero electricity designation. And, to achieve a net-zero water status, the same grant will fund materials and equipment needed for a composting toilet, a rainwater metering/filtration system and lab sink stations. Sun Club is continually looking for partners to help cultivate long-term sustainability and environmental stewardship among communities. If your park system or recreational department is interested in implementing sustainability best practices, Sun Club would like to hear from you. Through funding support to local nonprofits, Sun Club is working to change the way people impact the planet. Need Funding and Access to Sustainability Experts? Stacy Mehlhoff is the Executive Director for Sun Club.